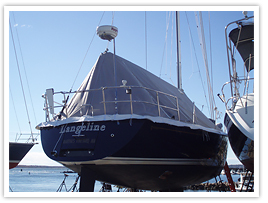 Whether your boat is stored in or out of the water, no other cover shields it so effectively from ice and snow, sea salt, and the effects of pollution. 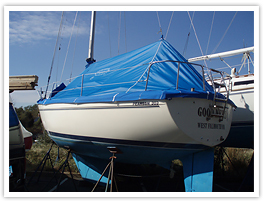 Fairclough boat covers prevent costly repairs due to fading gelcoat or damaged brightwork, while adding years of life and enjoyment. 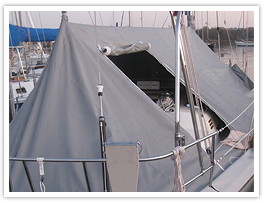 The only requirements for our Boomtents to work, you must leave your mast and boom in place and have either a perforated toe rail or stanchion base to tie to. 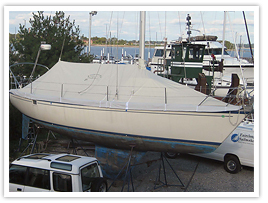 to knock the snow off, if done shortly after the storm. 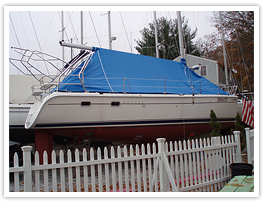 Remove cover dry and store your cover in a dry place. 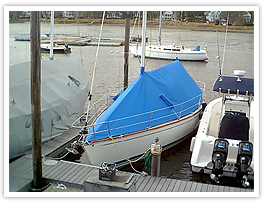 Note: Repaired covers must be picked up or arrangements made for shipping 30 days after billing to avoid $50.00 a month storage fees. When receiving your new cover you should save the box it was shipped in. Use this box to ship the cover back. Use UPS shipping for the cover. Alterations of new covers should be discussed with a Fairclough representative. When receiving your new cover you should save the box it was shipped in. Use this box to ship the cover back. Use UPS shipping for the cover.